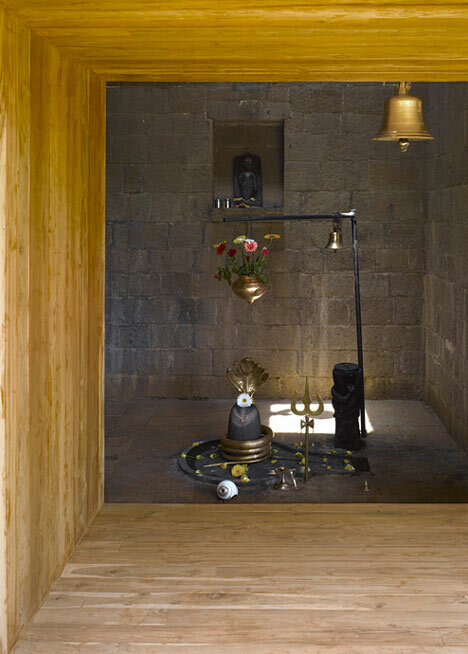 Photographer Edmund Sumner has sent us his pictures of a temple by Mumbai studio Sameep Padora & Associates. 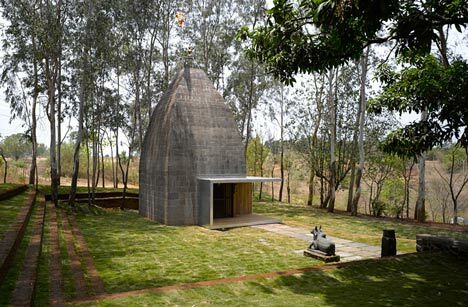 Called Shiv Temple, the project involved simplifying a traditional temple design by removing the usual decoration but maintaining symbolic elements. 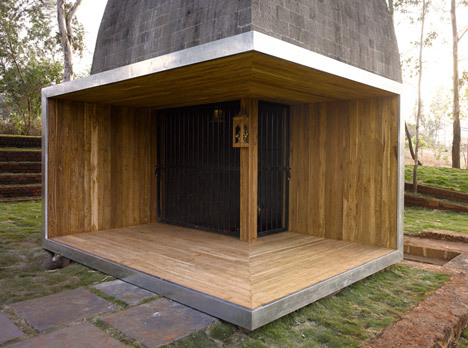 A wood-clad frame wraps around one corner marking the entrance, while the interior is illuminated by a skylight. 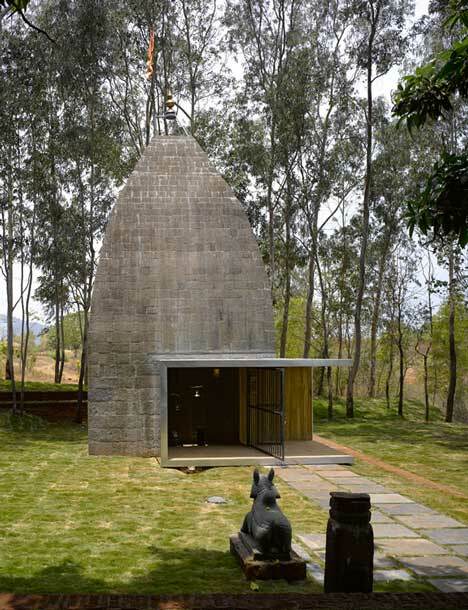 The temple was constructed by the villagers using local stone from a quarry near the site. 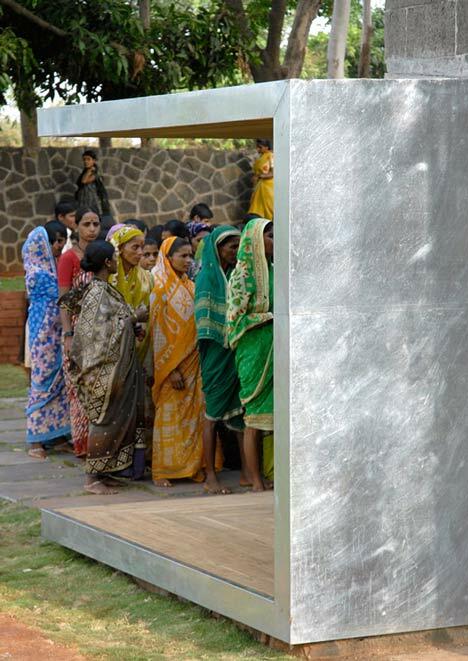 Designed in dialogue with the priest and the people from surrounding villages the temple design is a collaborative effort. 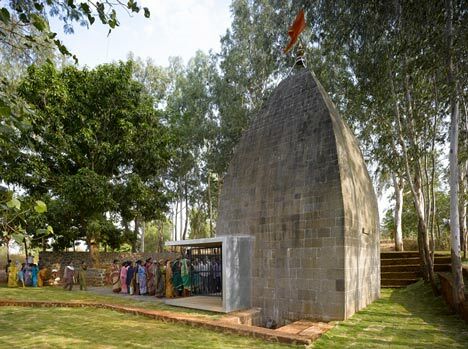 Built through ‘Shramdaan’ (self build) by the villagers, this temple was constructed on a shoestring budget, using a local stone as a primary building block because of its availability from a quarry within 200 meters from the temple site. 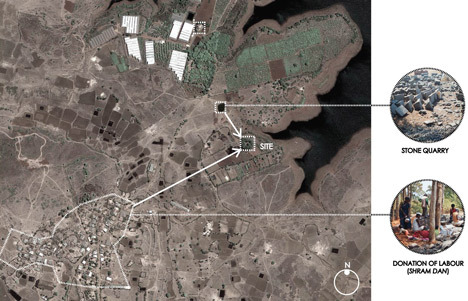 The stone’s natural patina seems to confer age, as if the temple had always existed… before inhabitation. In realizing the temple design in close consultation with the temple priest & the villagers, we attempted to sieve out through discussion & sketches the decorative components from the symbolic. Adhering to the planning logic of traditional temple architecture, the form of the temple chosen evokes in memory, the traditional shikhara temple silhouette. 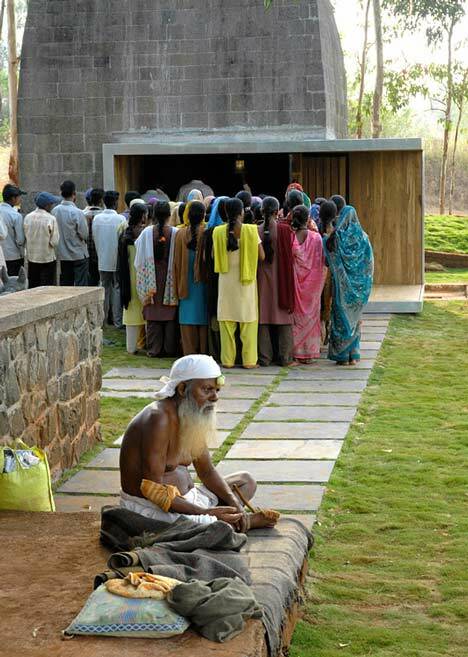 Only embellishments integral to the essence of temple architecture in memory actually appear in the finished temple. 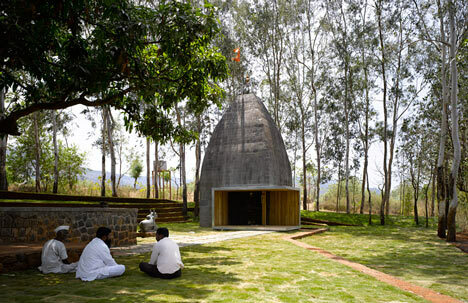 The heavy foliage of trees along the site edge demarcate an outdoor room, which become the traditional ‘mandapa’ (pillared hall), a room with trees as walls and sky the roof. The path to the temple winds in between white oak trees till two free-standing basalt stone walls embedded in the landscape create pause as well as direct a person onto the East-West axis on which the garbagriha / inner sanctum lies. 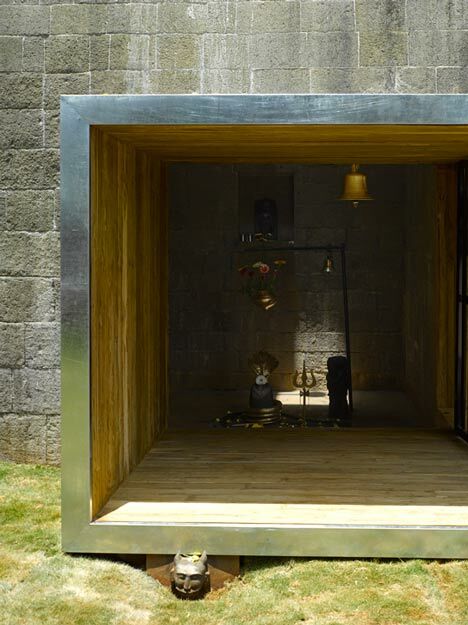 Entry to the sanctum is through an exaggerated threshold space which in turn frames the outside landscape for the inside. 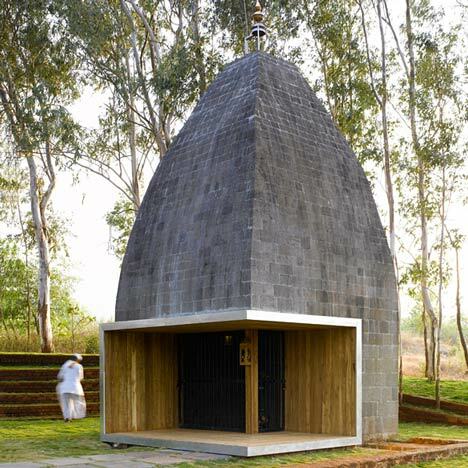 Stepped seating on the southern edge of the site negotiates steep contours while transforming the purely religious space into a socio-cultural one used for festival & gatherings. 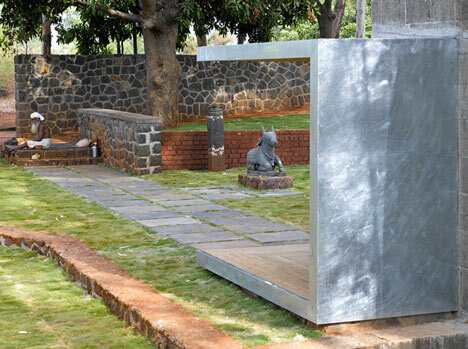 Religious Iconography in the form of statues of the holy cow, Nandi and Lord Vishnu’s avatar as a turtle become installations in the landscape and hence find their positions in a natural setting of the metaphoric sky-roofed mandapa. 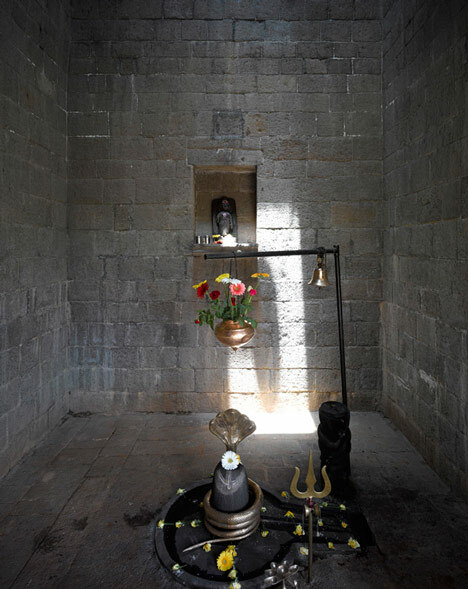 The ashtadhaatu (8 metal composite) temple kalash (finial) is held in place by a frame which also anchors a skylight to allow light to penetrate the inner sanctum/garbagriha.